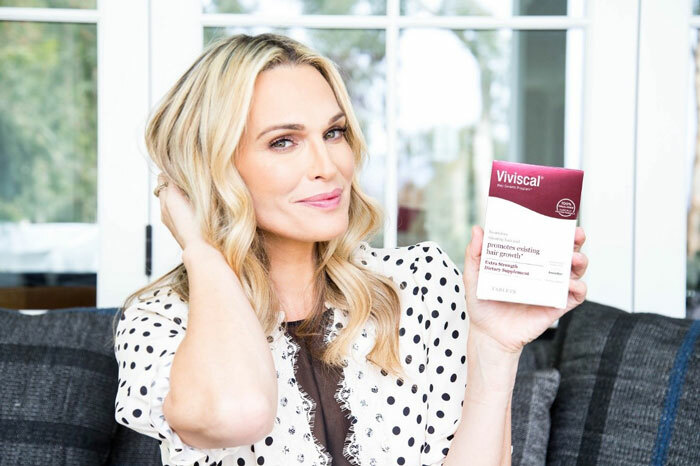 In our Molly Sims interview, you’ll learn about the 45-year-old model, actress, and mother’s dedicated approach to having a strong skin care routine, her entire morning and nighttime routines, and why she isn’t afraid to admit that she takes pills to prevent hair loss. 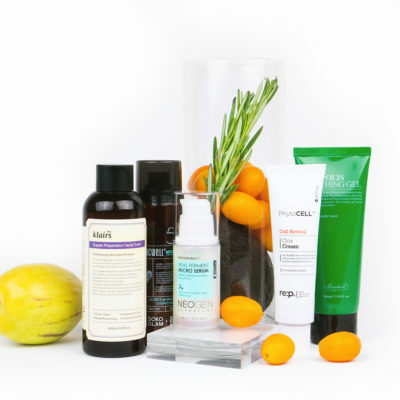 As a busy mom and businesswoman, how do you find time for skin care every day? Honestly, taking care of my skin wasn’t really a priority to me until this year. I made my New Years Resolution to take care of it a lot more and I’ve seen some insane results…even my husband has noticed! My morning and evening skin care routine is no more than 10 minutes. And somehow I fit in a shower in those 10 minutes. I also use my time wisely. I try to do a sheet mask while I’m making the kids breakfast or giving them bath—it kills two birds with one stone. You’ve recently talked on Instagram about your struggle with melasma and hyperpigmentation. What are your best tips for treating these issues? I have strict skin regimen, which I’ve shared on my YouTube channel. But the biggest way I’ve tackled my melasma has been going to Nurse Jamie. She has been using a Pixel Laser on me, which has really been helping. Plus, I’ve been trying to keep my face out of the sun and wear a lot of sunscreen. What are your favorite products for melasma? I think the key product to treating melasma is to use a good vitamin C serum in the day. I love using the iS Clinical’s Pro Heal serum in the morning and then a retinol in the evening. I swear by Shani Darden’s Retinol Reform—it has changed my skin. What are your favorite products for hyperpigmentation? As for hyperpigmentation, I use Dr. Dennis Gross’ Alpha Beta Peel Pads at least two to three times a week. They help brighten and exfoliate my skin and I always have a glow after. I also think it’s important to have a good alkalizing toner. I’m obsessed with Biologique Recherche’s Lotion P50 PIGM 400— it’s a hero product of mine. What is your full skin care routine? Oh wow, my entire routine? I just did an entire YouTube video on my morning skin care routine and showed how I apply it all. My routine changes so much because I’m constantly trying new products but here’s what I’m using right now. Cleanser: Mary Kay Facial Cleansing Cloths—They’re gentle enough for the morning where it doesn’t strip my skin and it get’s any leftover makeup off. Plus, since they’re dry, they’re so easy to travel with. Exfoliant: M-61 Power Glow Peel or Dr. Dennis Gross Alpha Beta Peel—I mentioned the peel pads before, but they help with any discoloration and hyper pigmentation. You should exfoliate every two to three days. Toner: Biologique Recherche Lotion P50 PIGM 400— Hands down the best toner on the market. It’s not crazy expensive and really gets the job done. I’ve turned everyone onto this product and it doesn’t disappoint. Vitamin C: iS Clinical ProHeal Serum Advance Plus—This vitamin C serum has great anti-aging benefits and vitamin C helps with brightening. It’s on the pricier side, but I’m a firm believer in investing in your skin. 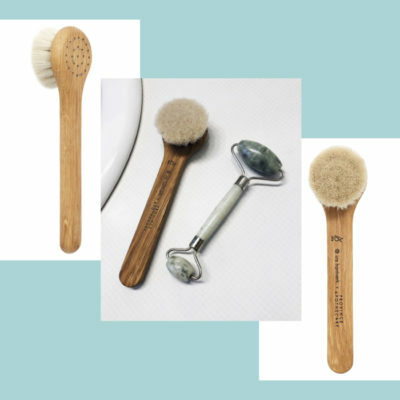 Facial Massager: Nurse Jamie Uplift Massaging Beauty Roller—Believe the hype! I know it’s all over Instagram, but it really does work. It helps with lymphatic drainage and reduce any puffiness in your face that may have been caused by staying up all night with your kids or too many glasses of rose. 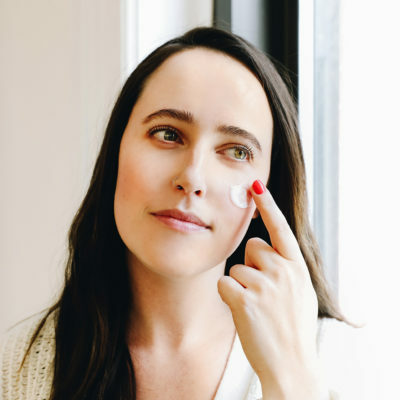 Eye Cream: Retrouve Revitalizing Eye Concentrate—People who follow me on Instagram know how much I’m obsessed with this eye cream. It’s definitely not cheap but my under eyes have ever looked the same. I sometimes see my husband sneak into my drawer and apply it on himself. Moisturizer: Dr. Barbara Sturm Hyaluronic Serum—In the morning I like to use this serum as my moisturizer because it’s so lightweight. It gives me the perfect amount of hydration that lasts the entire day. Sunscreen: Supergoop Everyday Sunscreen—I can’t say anything but great things about Supergoop. I don’t know what it is about their formula that isn’t like other sunscreens. Primer and oil: Kevyn Aucoin Neo-Elixir Weightless Beauty Oil—I discovered this product a few months ago and I’ve been hooked ever since. Sometimes I’ll mix it with my foundation when I want some natural coverage. Cleanser: iS Clinical Cleansing Complex— Shani Darden got me hooked on this brand… can you tell I’m obsessed? At the end of the day, I like to use a cleanser that gets rid of all of my makeup but is still gentle on my skin. This one is just that. Serum: iS Clinical Active Serum— This is great for acne-prone skin (yes, I still get that pesky pimple every now and then) or anyone who travels a lot. It gets rid of any active breakouts and helps prevent any new ones from forming. Retinol: Shani Darden’s Resurface Retinol Reform—This is a great anti-aging complex that reduces and prevents wrinkles and targets hyperpigmentation. Moisturizer: Georgia Louise’s Sleeping Beauty Oil—This is full of vitamins and antioxidants that will nourish your skin while you’re sleeping. I use about four drops with or without a cream (depending on how dry m skin is) and I wake up with soft skin and less fine lines. If my skin is on the drier side, I’ll finish my routine with the Summer Fridays Jet Lag Mask. I’ve never woken up with smoother and more hydrated skin in my life. Lots of women suffer from hair loss and thinning but are afraid to talk about it What barrier are you trying to break by being a Viviscal ambassador? I just try to be as transparent with my audience as possible. Hair loss can literally happen to anyone, especially models and actresses. We get our hair processed so often that it has become second nature. But unfortunately, with social media and the new age, everything seems perfect. When in reality, your favorite celebrity is probably wearing extensions to make her hair look longer and thicker. I wanted to open up about my experience with Viviscal since I’ve taken it since I was in my early 20s and share that you can take control of your hair growth with a tablet—that actually works. How do you incorporate Viviscal into your hair routine? I take Viviscal twice a day—once in the morning with my breakfast and then once in the evening with my dinner. The tablets are my favorite because I’ve taken them for 20-plus years and they work! I first discovered them in Paris and all of us models used to pass them around as if it were our little secret. Then I found them at a drugstore by my apartment in New York and I haven’t stopped taking them since (aside from when I was pregnant). As a mom, have you started your kids on any type of skin care, like sunscreen? At what age do you think it’s important to start them on a routine? Yes! All of my kids wear sunscreen, especially since we’re in Los Angeles and the sun is pretty much out every day. I wash their faces in the bath everyday but I think a good time to start a regimen would be in-between six and nine-years-old. We loved your post about dressing the part for a beachside wedding! Do you do anything special skin care and makeup wise to prepare for big events like weddings? Aw, thank you! I always try to get a facial before any big event. Whether it’s an intense peel by Shani Darden or Georgia Louise’s hydrating and sculpting facials. They’re the woman responsible for my skin before any big event. When I’m not able to get into either of them, I’ll do a little DIY facial at home with a good scrub from m-61 and a Babor sheet mask. 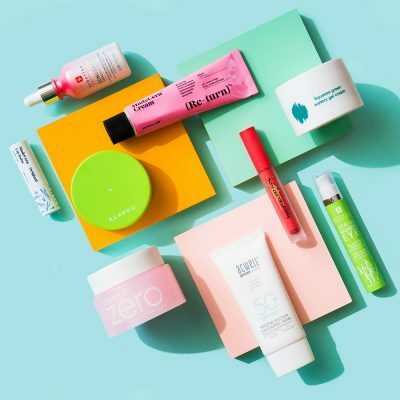 Do you use any Korean beauty products? I do! 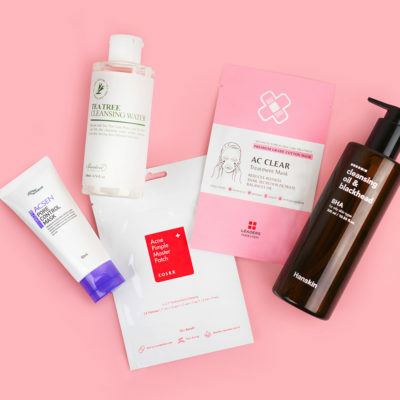 I’ve actually just started to get on a K-beauty kick recently. I’m fascinated with the whole “glass skin” trend. I think what’s so great about K-beauty is that it leaves your skin radiant just like a piece of glass. Glass skin is what I’m striving for! + What’s the coolest thing you learned in our Molly Sims interview? Share your thoughts in the comments!